A stylish and chic wrap tunic. 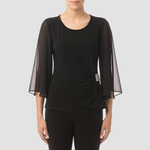 This wearable tunic top benefits from a wrap over look and a full sleeve. 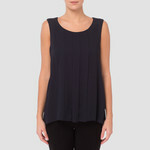 It features mesh leatherette detail at the hem and cuffs and has a bias cut hem. Easily dressed up or down!